For some, the ability to confess their sins and receive forgiveness in their native tongue was a blessing beyond expression. 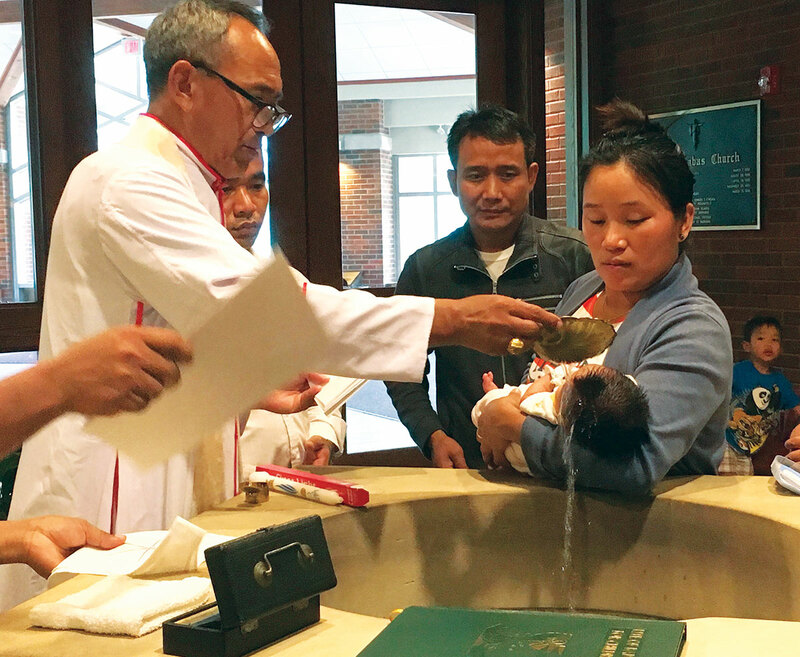 Resettled in Indianapolis as refugees, half a dozen families from Myanmar (formerly Burma) have made St. Barnabas Parish their spiritual home. All members of the ethnic group known as the Chin tribe, these families speak a very specific dialect that distinguishes them even from other southeast Asian nation tribes. All of the families at St. Barnabas are internationally recognized refugees who fled Myanmar during a decades-long conflict between its oppressive military junta and rebels opposing the government. Some saw violence and killing firsthand, some spent years in refugee camps in neighboring Thailand before being resettled in America. Very few, if any, of these refugees were able to learn English before being sent to their new home. Upon arrival in the United States, these Chin families were unable to find Catholic liturgies in their own dialect. Even efforts to connect the group with other Myanmar refugees at nearby St. Mark the Evangelist Parish or St. Pius X Parish, both in Indianapolis, did not bridge the language barrier. The groups at these parishes largely belong to a different tribe and speak a different language. The St. Barnabas Chin community remained isolated in their struggle to keep the faith. An opportunity to better meet the needs of this group came this summer. Members of the community learned that a leader from their home country, Bishop Lucius Hre Kung of the Hakha diocese in Myanmar, was willing to visit the parish for a month and minister to its members. The leadership at St. Barnabas agreed to host the bishop in its rectory, provide space for celebrations and facilitate the visit. “After arriving, I feel at home for the wonderful hospitality and wonderful arrangement and all this,” Bishop Hre Kung said with a huge smile. From the moment of his touchdown in Indianapolis on June 17, the bishop kept a dizzying schedule. The Chin community held a welcoming celebration at St. Barnabas just hours after his arrival. They also invited other Myanmar refugees from St. Mark the Evangelist and St. Pius X to a Mass with the bishop, then hosted a farewell dinner as Bishop Hre Kung’s time in Indiana drew to a close. In addition to these large gatherings, Bishop Hre Kung celebrated Mass nearly every day, met with parish staff and performed home visits. Several families brought infants to him for baptism, and the bishop estimated that “almost all” of the community came to him for confession. “He’s the last to come in at night,” laughed Msgr. Volz. Before he boards the plane for the approximately 20-hour flight back to Myanmar, Bishop Hre Kung plans to visit Chin communities in Kentucky, Tennessee, North Carolina and Kansas. He will leave the United States on Aug. 8. One of the bishop’s priorities was to help local staff plan to better serve the Chin families. He and many community members said that some Catholics were abandoning the faith in favor of attending local Protestant churches that offer services in their language. The staff at St. Barnabas also facilitated a meeting between Bishop Hre Kung and Msgr. William F. Stumpf, archdiocesan administrator, to make the archdiocese aware of this new need and request pastoral guidance. When the bishop communicated that about 20 children of Chin families wanted religious education, Msgr. Volz and pastoral associate Patty Cain met with the leadership of the parish elementary school to discuss how to fulfill the request. The parish agreed to continue to provide space for the community to meet for fellowship and catechesis in the Chin language. The bishop himself hinted that he desired to send a priest who speaks their dialect if it could be arranged at some point in the future. For the bishop’s final Mass at St. Barnabas, he concelebrated a Sunday liturgy with Msgr. Volz for the entire St. Barnabas parish community. As parishioners streamed of out the doors, English- and Chin-speaking members alike stopped to shake his hand, welcome him and thank him for coming.